A bit o' luck, a lot o' fun for St. Patrick's Day! 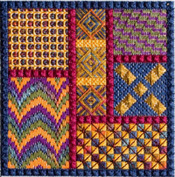 This quick to stitch sampler features Smyrna crosses, herringbone leaves and backstitch, all completely illustrated with large stitch diagrams. 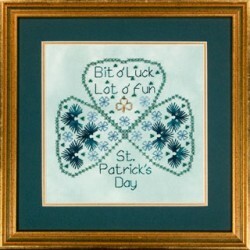 Shown on 28 ct. Watercress Jobelan, this sampler can be worked on 14 ct. fabric. A shamrock charm is surrounded by bead "shamrocks" worked with Mill Hill glass seed beads, and stitches worked with Crescent Colours Shamrock and Bejeweled, and Kreinik #4 Braid. Finished size about 6" x 5 ¾"